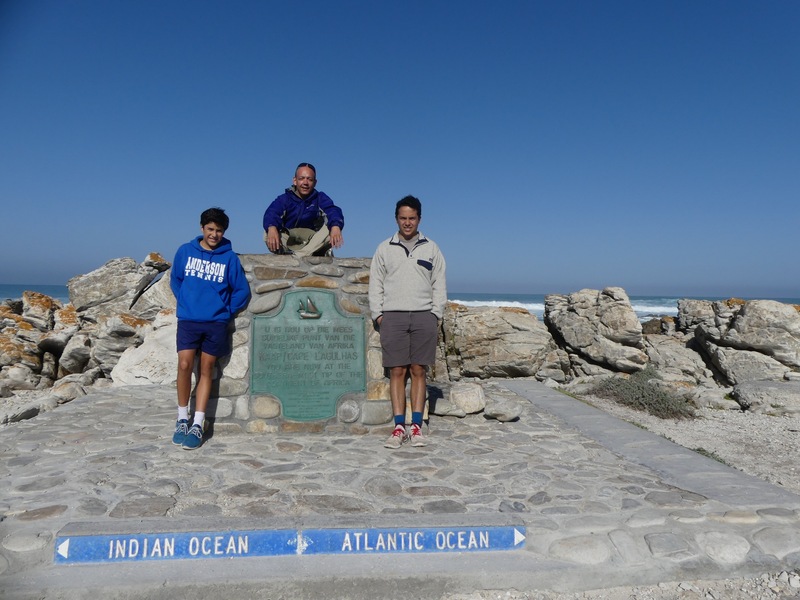 Our next stop was Cape Agulhas. Agulhas is Portuguese for needles. 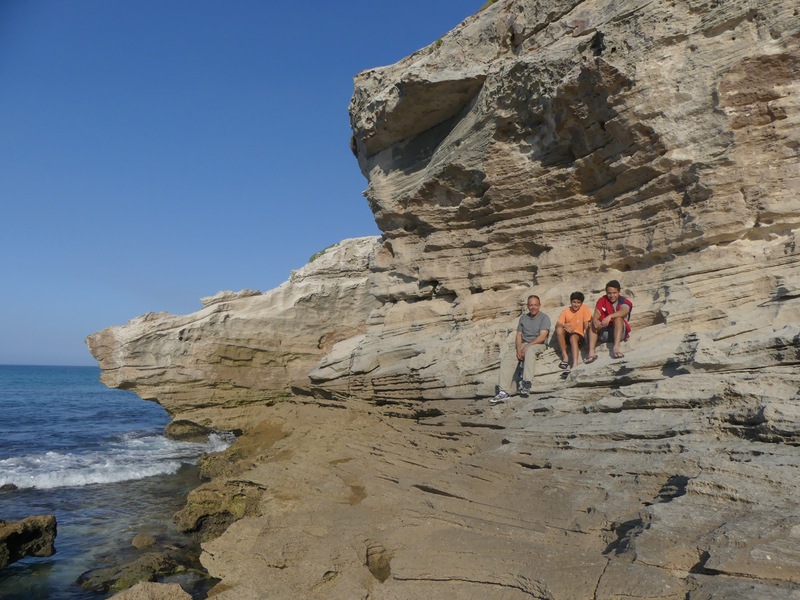 You could be misled into thinking that the Portuguese named this cape so because of the needle-like rock formations on the beach. There are tens of shipwrecks just off the coast here. The real story is that it was named so because these early sailors noticed that the needles on their compasses pointed true north without being deviated by the magnetic field. In other words, the earth’s magnetic field has no effect on compasses and its needle will point true north when held here. Have you guessed why yet? 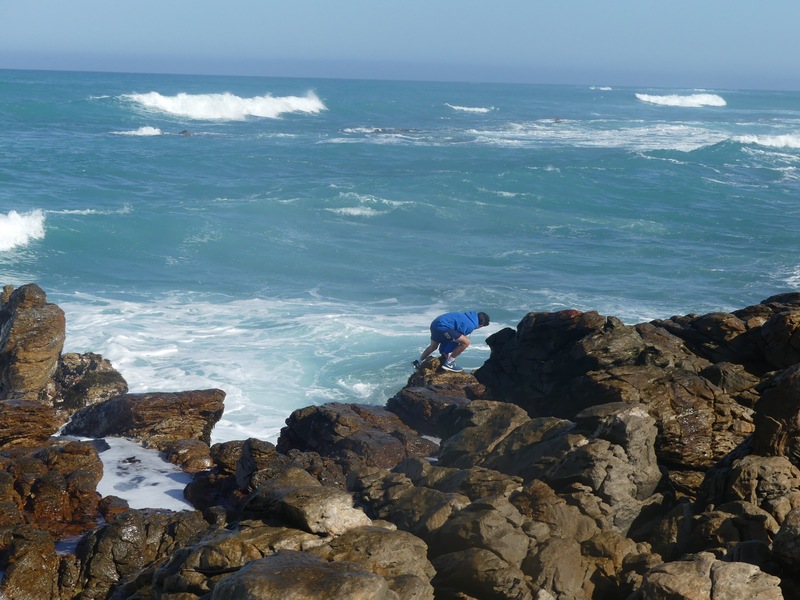 Cape Agulhas is the true southernmost point of Africa. If you were to swim straight out from here, and survive, you would reach Antarctica! How cool is that? Here is the place where the Atlantic and Indian Oceans meet. This place is a bit out of the way which makes it perfect as tourists are few. The water is freezing of course but that didn’t deter the boys from trying it out. They tried to best one another by going out farther than the other had and ended up soaked of course. We continued on to Waenhuiskrans Cave which is allegedly a gem. To get here you need to drive on an unpaved, rocky path and after parking, walk up a sandy hill and down the other side to reach it. 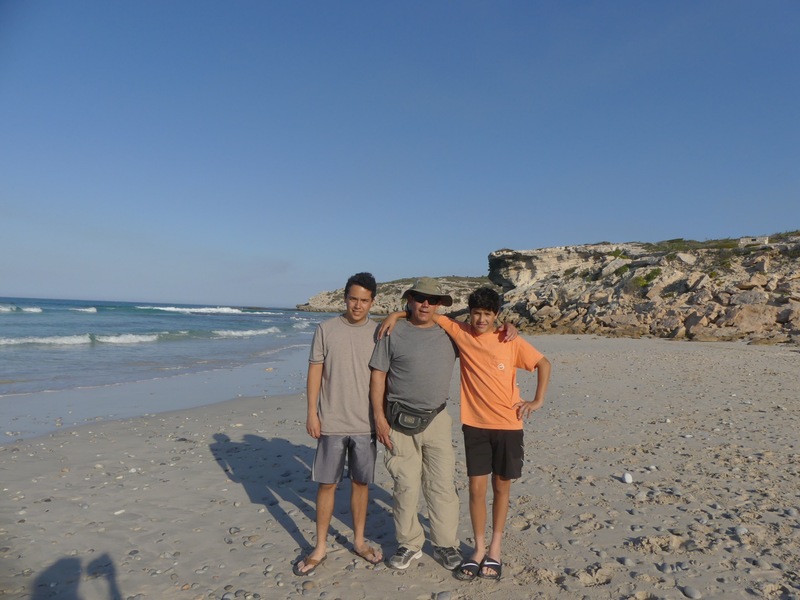 The place is beautiful and there is a soft sandy beach to go swimming in if you can bear the frigid water. 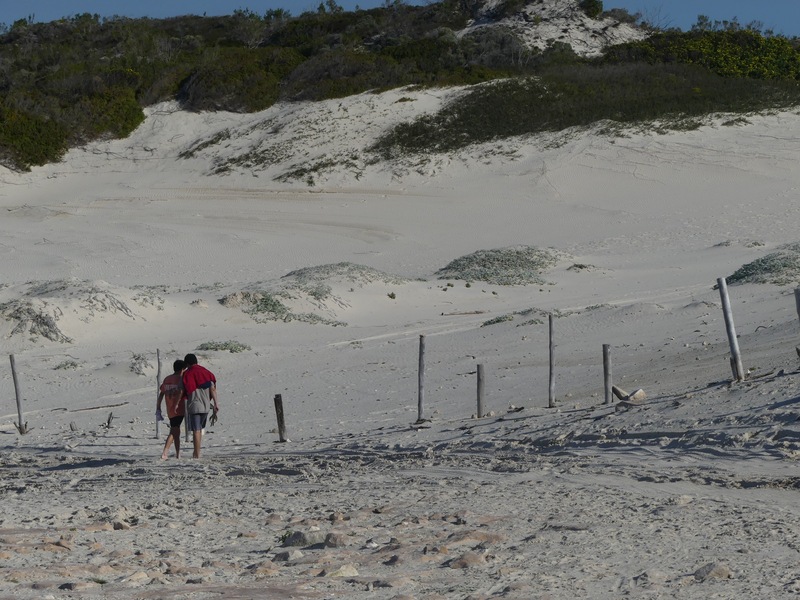 It is surrounded by dunes and locals come to fish as well. After all that hiking, we were deterred by the high tide. See, the cave is only accessible at low tide which happens late in the evening, a tiny fact which we were unaware of. We couldn’t hang around because we still had several hours driving to get to Knysna where we had a reservation for the night so we hunted for sea shells and moved on. I guess we will just have to come back on another trip to find out if indeed Waenhuiskrans Cave is as astounding as they tell. We arrived in Knysna in pitch blackness. This being winter in the southern hemisphere, dusk happens about 5pm and by 6:30pm all light is gone. While the day lasted almost 23hrs in Iceland, here our days are so short, we barely get time to visit the sites we’d like to visit; it’s been a huge contrast. It doesn’t help that everything closes incredibly early. South African time also seems to run slower than we’re used to. The next morning we took a long drive to Oudtshoorn which lies over the mountains. Why? 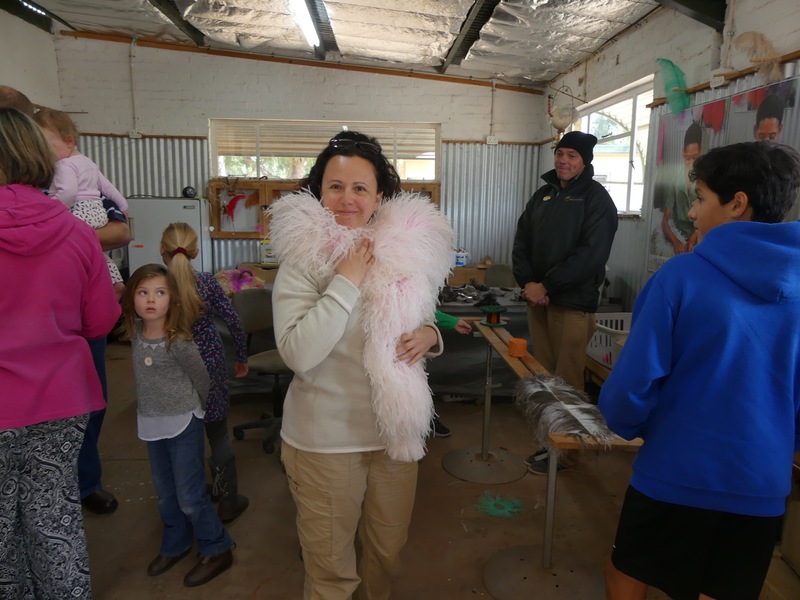 To see the ostriches of course! and even dusters. But I haven’t gotten to the good part yet. 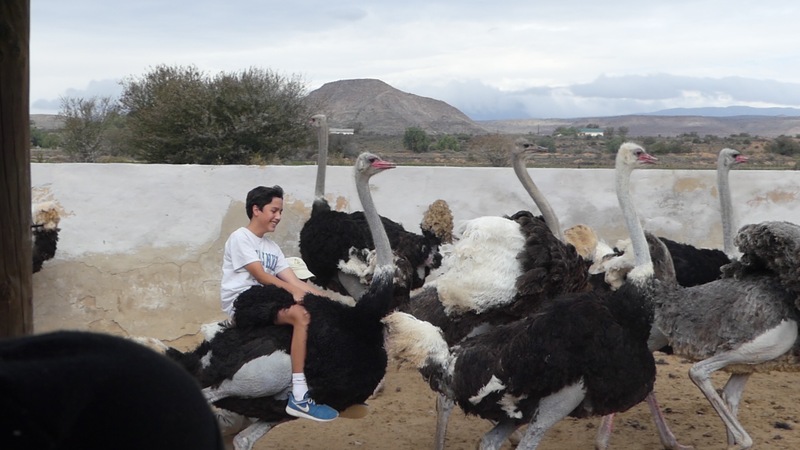 That’s Alejandro riding an ostrich! 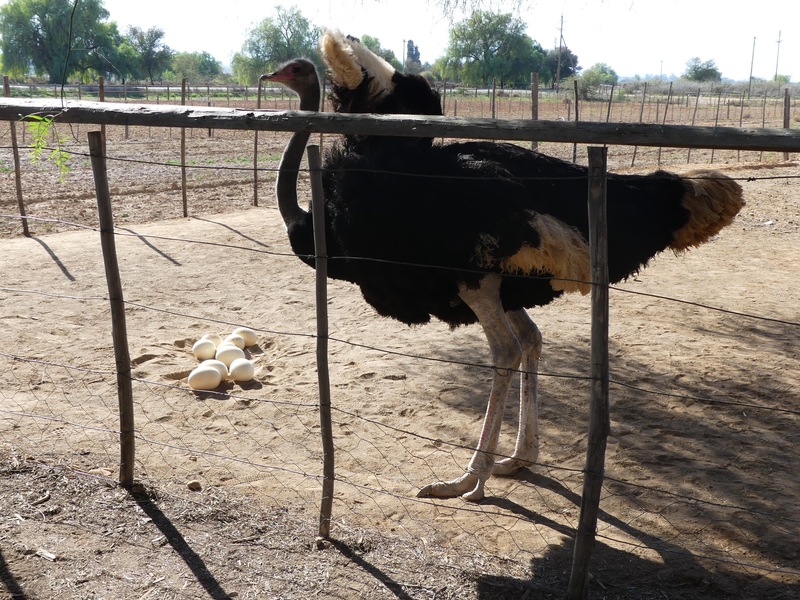 Yep, this is the reason we came all this way: to ride the ostriches. It was a hoot! The ostriches of course don’t appreciate getting a rider and they take off running around like headless chickens, it’s hilarious. After everyone who wanted to had gotten themselves tossed around like rag dolls, it was time for the Ostrich Races. They actually hold races here with jockeys and all. Ferrari (red) lost to Mercedes (green) by a feather! 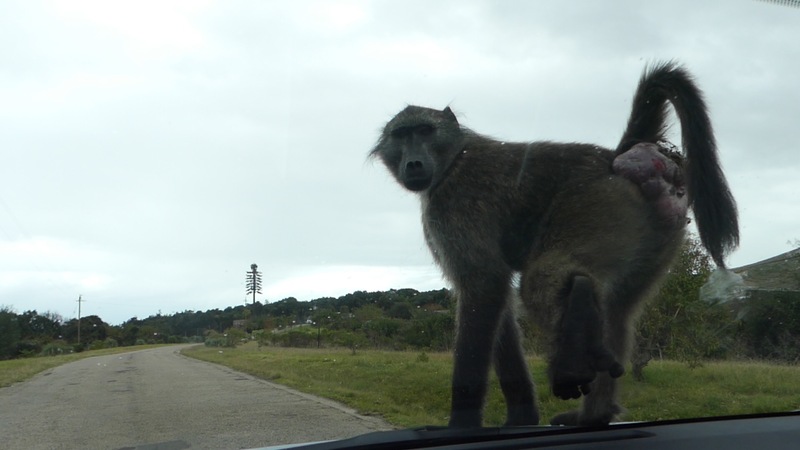 After the exhilaration of ostrich riding, we drove back to Knysna and visited “The Heads”. Knysna is a beautiful town located on the Knysna Lagoon. The lagoon opens to the ocean which moves in past “The Heads” and fills it up at high tide. The Heads are famous locally for being responsible for fishing boats capsizing and the subsequent loss of life on their rocky shores. While treacherous to navigate, they are beautiful to admire. We even spotted whales out at sea. 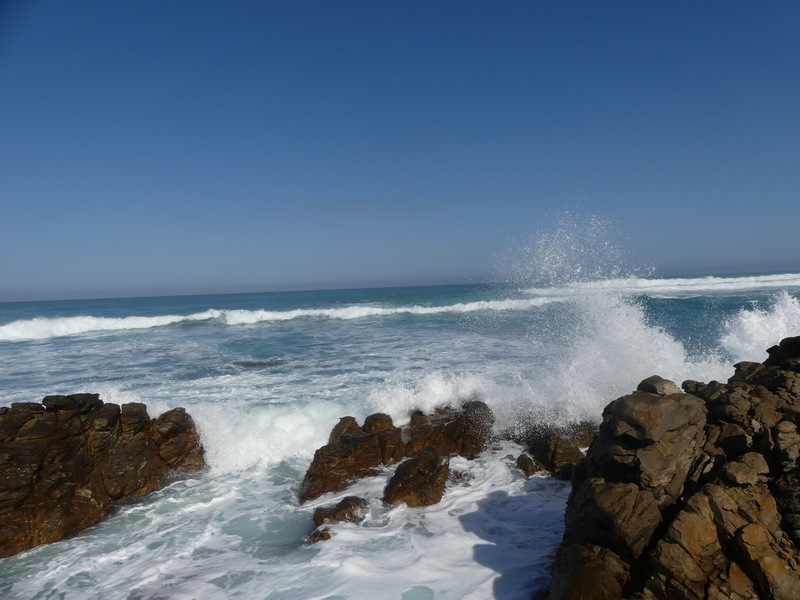 Also in this area are two national parks which we had planned to visit: Wilderness and Robberg Natural Preserve. The boys nixed that idea the very next day. 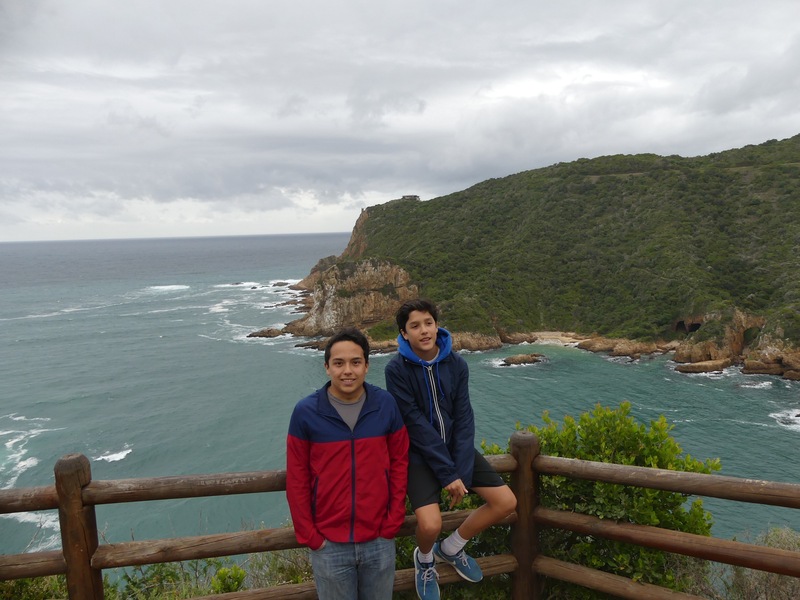 Next to Knysna is Plattenberg Bay which is the site of many admirable attractions and we visited most of them over the next few days. and they are a nuisance. 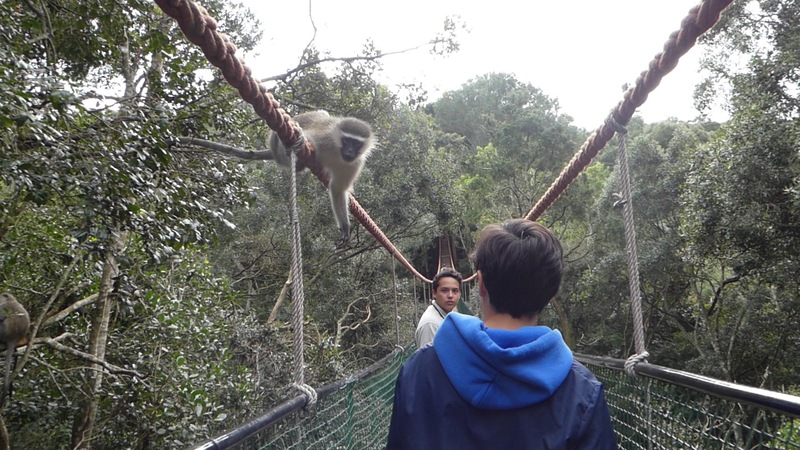 Our guide led us to the longest hanging bridge in South Africa where several Vervet monkeys were hanging out. 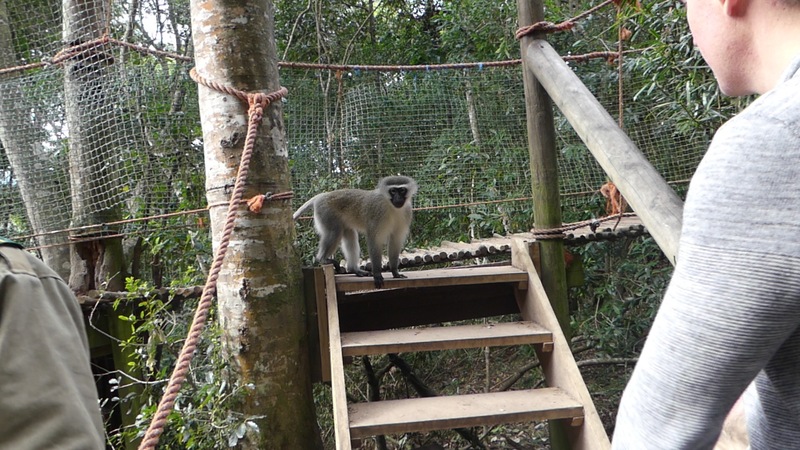 He explained that the monkeys are highway robbers, they are actually waiting for the tourists to walk by to steal anything they can from them so we had to put valuables, including my cheap sunglasses, away. He said that “as usual” males don’t respect the females so he had the boys go in front of me and Fernando in back. 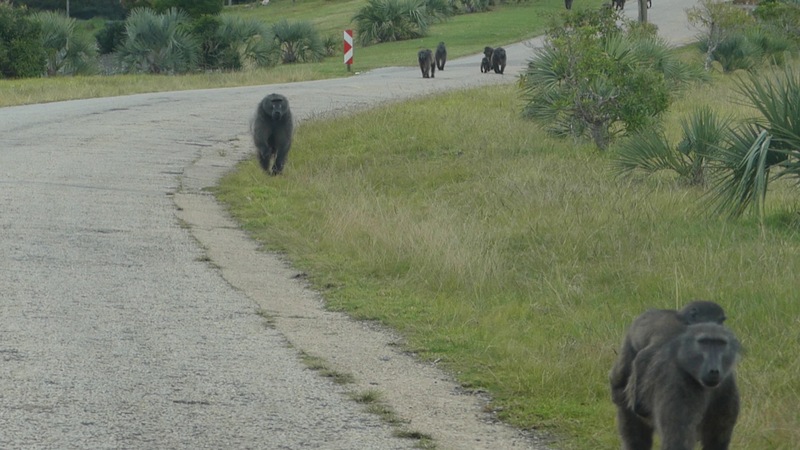 At one point, the boys walked too fast for me and one monkey took the opportunity to zero in on me. Fernando had to get in front of me to get it to back down. 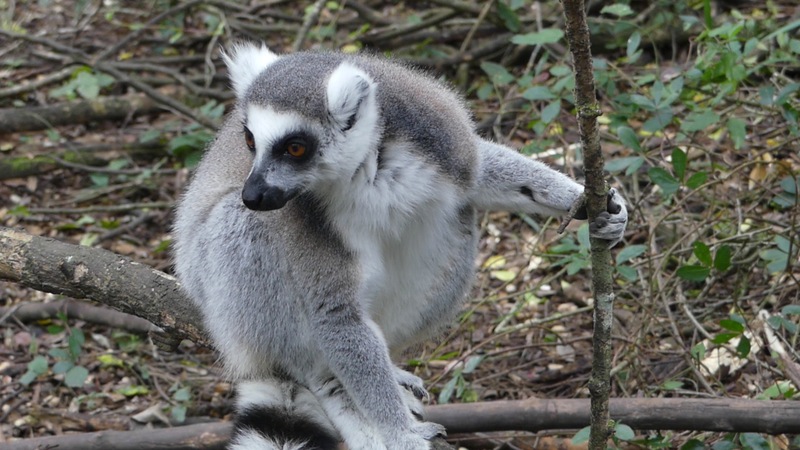 Sheesh, not even in nature can sexism be avoided… It wasn’t my choice to visit Monkeyland, the boys insisted; but I am glad they did because this place was one of the highlights of our visit here and I would wholeheartedly recommend it to anyone. 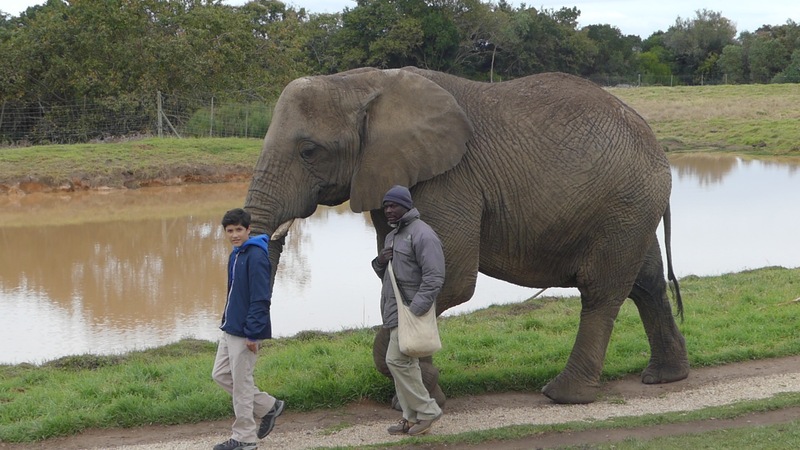 We then visited the Elephant Sanctuary. We got to walk thru the forest with the elephants while they held on to our hands with their trunks. It’s actually kind of gross, as if you had stuck your hand into a cow’s nose. We fed them seeds and melon pieces, rubbed and cuddled them and even rode them. 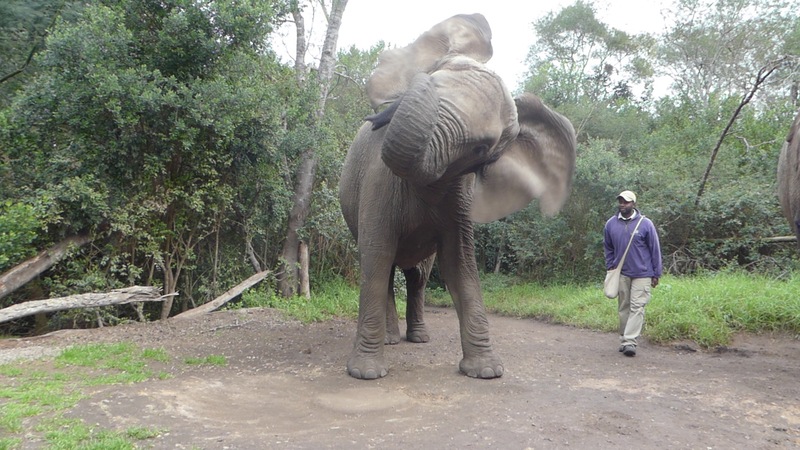 While getting so close to an elephant was an amazing experience, it was also very sad. We were assured that the elephants are treated humanely and are well taken care of but we left the park feeling kind of depressed about it. Unfortunately, we really can’t recommend this place, in our opinion, the word “sanctuary” in its name is misleading. The third sanctuary we visited was Tenikwa, dedicated to cats. 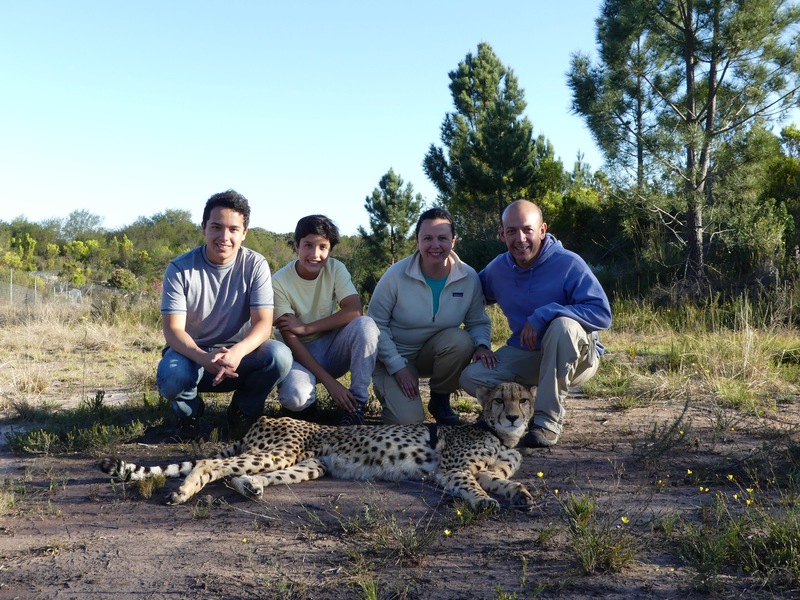 Here we got to visit with African Wild Cats, Servals, Caracals, Cheetahs, Leopards and Lions. We actually walked into the cages of all but the Leopards and Lions. They told us it was important to never turn our back to the cats and when Alejandro did so at one point the Lioness began stalking him. 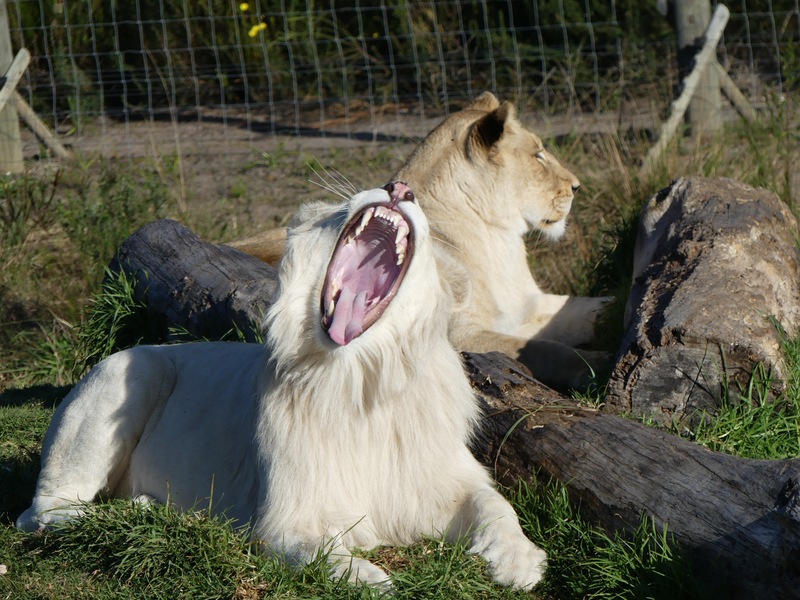 It was funny, until she actually jumped up a post and tried to get out of the enclosure and at him. It happened in an instant and took us all, including our guide, by surprise. 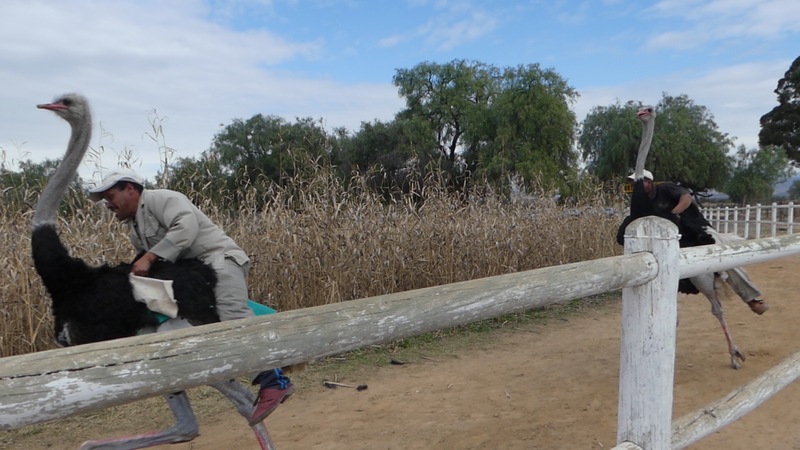 She had been lying lazily in the sun showing no interest in us and the next moment she was high on the wooden post with her eyes locked on Alejandro. Witnessing the power of that cat made me glad we had an electrified fence between us. 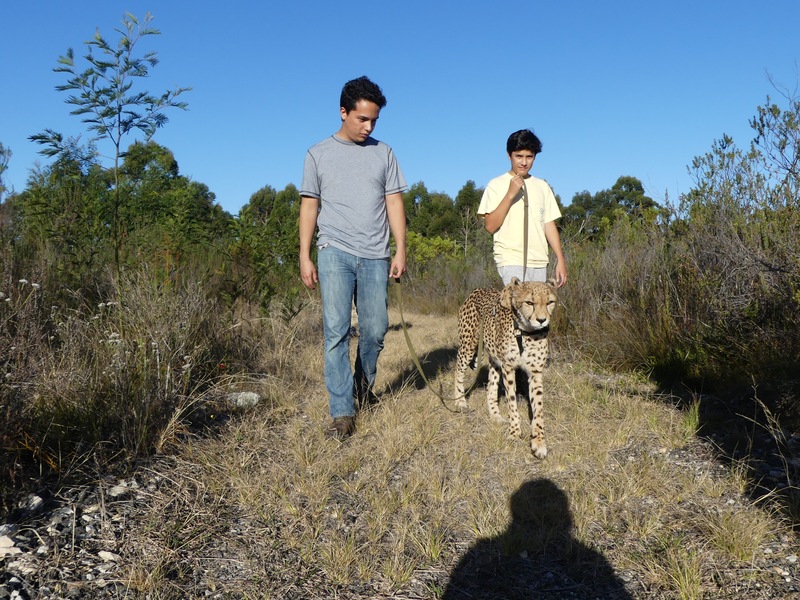 And then…we took Tanvi the Cheetah for a walk! We “walked” her all over the sanctuary but in reality it is more like she allowed us to walk alongside her. She would lie down or sit whenever she wanted and the guides (two of them this time) had to coax her into continuing, she mostly ignored them. As the boys said: “Tanvi does what Tanvi wants”. At one point she almost took one guide’s arm off for trying to grab the leash when she wasn’t ready. As comfortable as the walk was, it’s impossible to forget that this is a wild animal and can easily kill any of us in an instant. We got the feeling that the animals here were respected and allowed their space, something we didn’t feel at the Elephant Sanctuary. Tenikwa definitely gets our seal of approval. 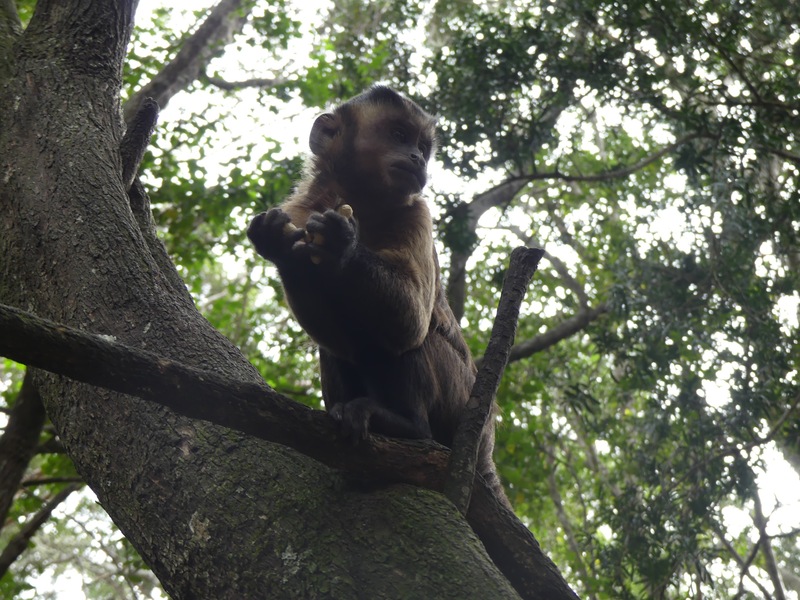 The one national park that I would not be deterred from visiting was Tsitsikamma. 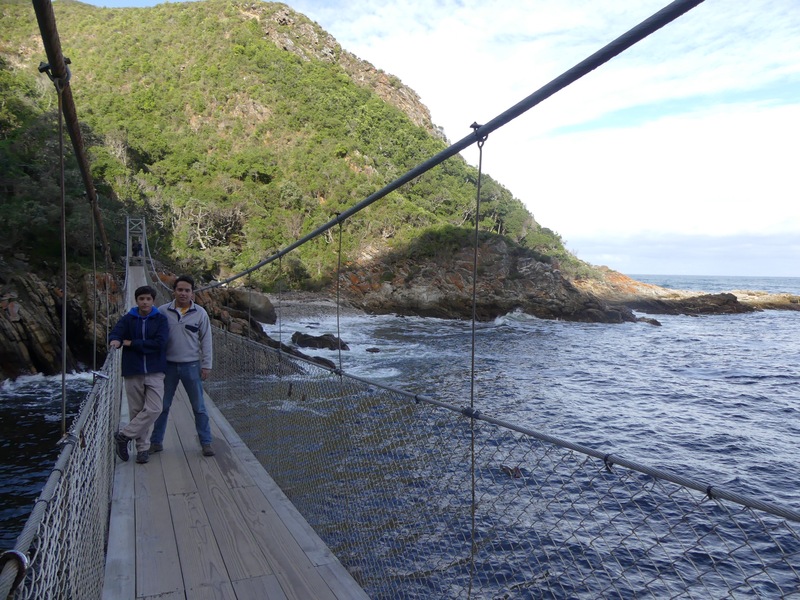 It is gorgeous and has a wooden suspension bridge over the Storms River.We hiked along the coast to get to the bridge and spotted whales playing in the ocean along the way. Unfortunately, they were far away and without a guide we can’t know for sure which kind they were but most likely they were Southern Right Whales which are abundant here. 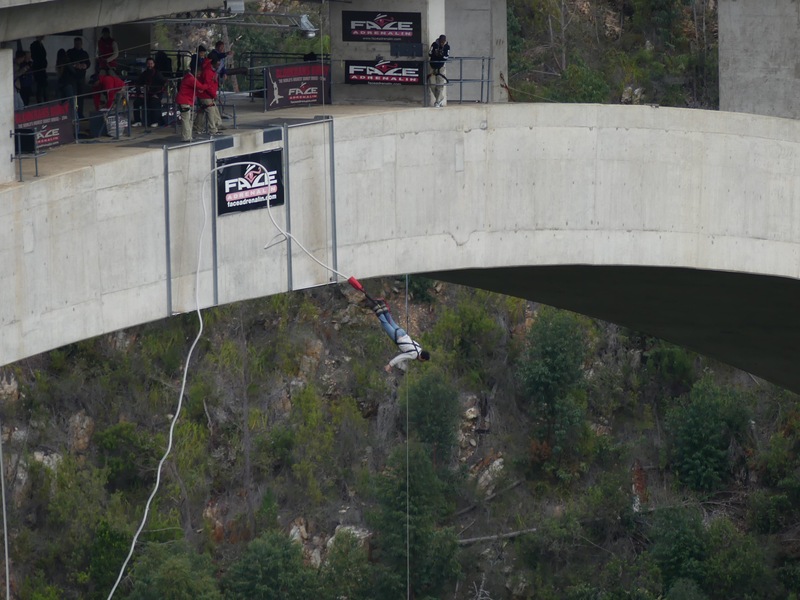 The highlight of this visit for the guys though was the Bloukrans Bridge which hosts the tallest bungee jump in the world at 216 meters. The place is full of European tourists and is probably the most touristy thing we’ve done so far. The guys loved it! Me? I stayed in the cafe and took pictures. 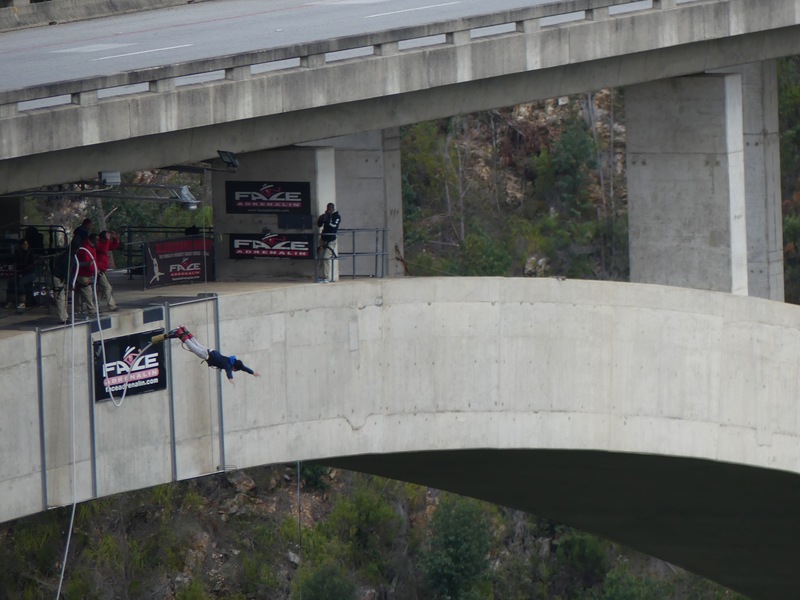 When all my friends jump off a bridge, I don’t follow them! They’ve been teasing me nonstop about it but honestly I have no regrets. We started our drive to Port Elizabeth late because of all these activities and arrived after dark. We’re flying off early tomorrow morning so we won’t get much of a chance to see this place but that’s alright. We’ve seen and done so much in the past few weeks that I think we’ll be alright. 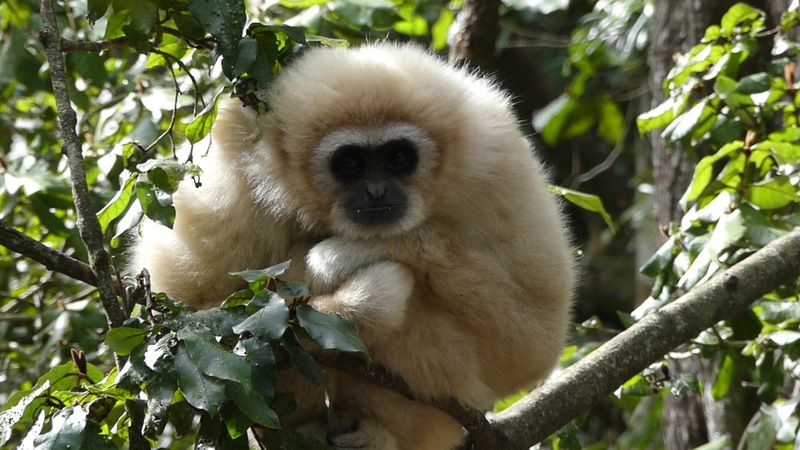 Excellent travel blog – allows me to live vicariously thru you. Haven’t been to S. Africa yet but just added it to my bucket list.